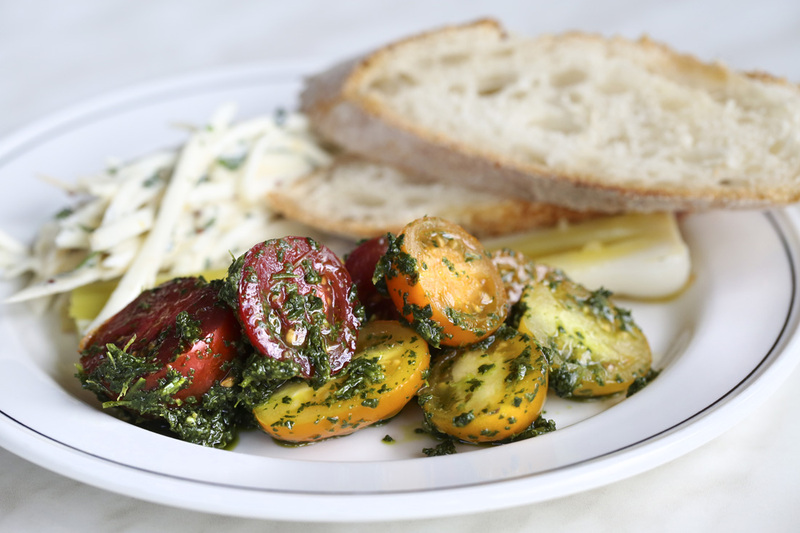 Seasonal ingredients and on-point execution define dining at Billy Allin’s Bread & Butterfly. As I sit down at a marble table in the brightly lit sunroom, slowly perusing the short menu at Bread & Butterfly, avocado toast catches my eye. I know it’s elemental, but I also know I must have it. Even as I’m telling the server—who appears either not to speak English or not be interested in talking to me (I prefer to think it’s the former)—that I’d like the avocado toast for breakfast, I’m wondering why I’d waste a restaurant meal on something I could so easily make at home myself. Red and yellow herb-marinated tomatoes pair perfectly with fresh crusty bread. Most people with rudimentary cooking skills can master the ubiquitous avocado toast— just look to Instagram for proof of its mass appeal. 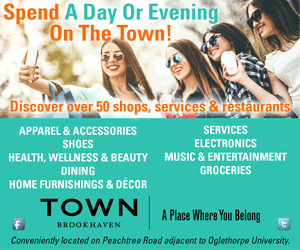 Yet here I am, seated in the all-day French café created by one of Atlanta’s most celebrated chefs, paying $8 for a breakfast I make myself at least three times a week. I throw in a “side order” of scrambled eggs with smoked trout on brioche to convince myself I’m not that basic. The bread is a meticulously-toasted sourdough; the slightest crunchy exterior gives way to a light center and tastes as if it just came out of the oven. And it likely had: B&B makes all of the bread and pastries in-house and from scratch daily. 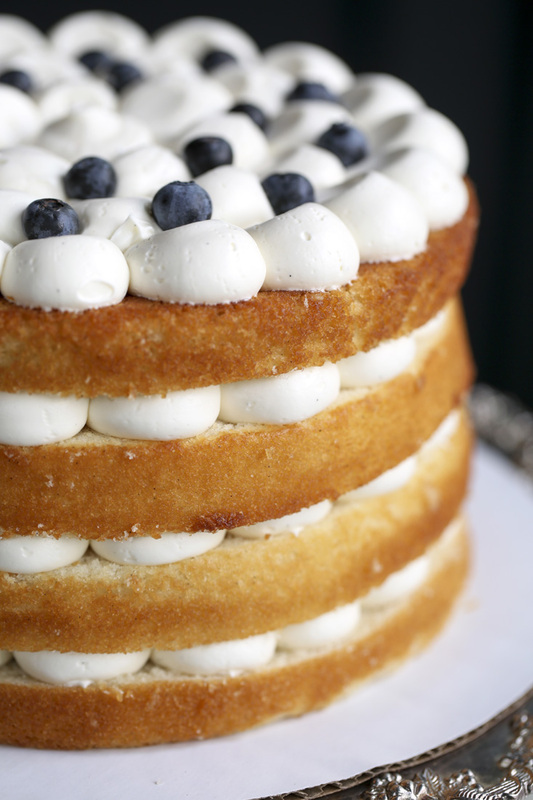 Like most everything else on the menu, B&B’s desserts stand out for their fresh simplicity. The avocado, so flawlessly ripe and buttery, accented with the slightest twist of a lime and freckles of chili flakes, peeks out from under a soft-poached egg that nearly oozes its velvety yolk just at the mere idea of picking up my fork. A lightly-dressed salad spiked with razor-thin squash rounds envelops the dish, adding the precise amount of freshness breakfast requires. After three more visits to the classic French bistro, I’ve yet to find one dish I wouldn’t order again without hesitation. They are each edible essays in restraint, minimalism and, perhaps most of all, clarity; each humble ingredient tastes like the superior version of itself. At lunchtime, it’s mandatory to start with the Three Salads, a rotating trio of fresh vegetables in a mustard-heavy vinaigrette. During my visit, it was marinated beets, potatoes and haricot verts. The creamy shrimp remoulade is also excellent, and if you’re feeling naughty, the potato and raclette gratin with crispy pork, frisee and sherry vinaigrette will certainly do the trick. 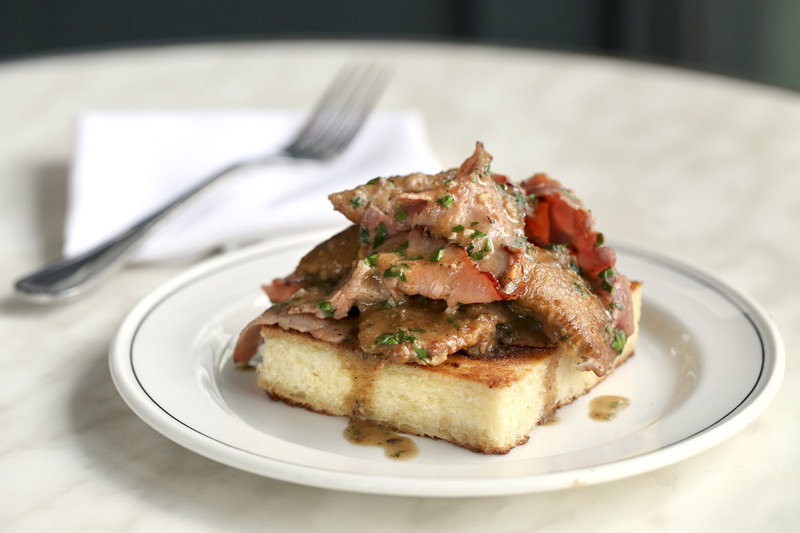 B&B’s chicken liver toast is served with crispy ham and an earthy jus. Perhaps nothing is more comforting than the tomato soup, sweet and creamy, with the slightest tang and topped with one of the more impressive puff pastries I’ve seen. I feel less ashamed of the mess I made around my bowl when our server tells me that no customer has finished this soup without needing a serious “crumbing down” afterward. That’s the sign of a good puff pastry. No flakes, no thanks. Order a few carafes of wine for the table to feel truly Euro. There are also 60 bottles to choose from, many of which are affordable and either French of American. Then start with the charcuterie plate, unpretentiously served on a simple dinner plate alongside cornichons and mustard. This meat lover’s dream comes with cured hams and terrines that would make Julia Child proud. Because you need another taste of that brioche, you must order the chicken liver toast. The livers are characteristically pungent, cut with crispy ham and buttery bread and smothered in an herbaceous jus to make everything get along famously. To me, this is France on a plate. The Burger Américain, arguably one of our city’s best, is blanketed in melted Swiss and finished with grainy brown mustard. B&B is serving what I deem the best burger in Atlanta right now. 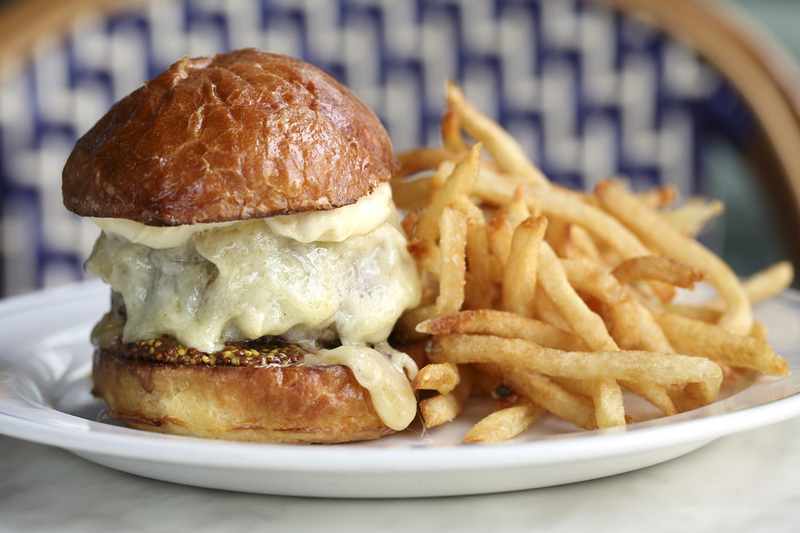 The Burger Américain is smothered with melted Swiss cheese, sweet caramelized onions and zesty grain mustard. But in true Allin form, the vegetables are not to be overlooked. The seasons call the shots, so the menu changes in that regard, but if you go while the squash salad with bulgur is on the menu, do yourself a favor and order two. It’s shocking how much flavor is packed in, and it’s totally guilt-free after all that bread. It also epitomizes what B&B is all about: clean, classic cuisine, uncomplicated by modernist techniques and bizarre ingredients that have swayed so many chefs in Atlanta. B&B is not a French-inspired bistro that serves some strange amalgamation of Parisian food. Rather, its menu is timeless, serving all the iconic French dishes you’d expect. I’m particularly captivated by the pastry display at the coffee-during-the-day, wine-at-night bar. Pastry chefs David Garcia and Abigail Quinn turn out buttery croissants that taste so light you can nearly convince yourself they’re healthy. One of those, or a sweet brioche or perfect baguette, will ruin all other bread for you. 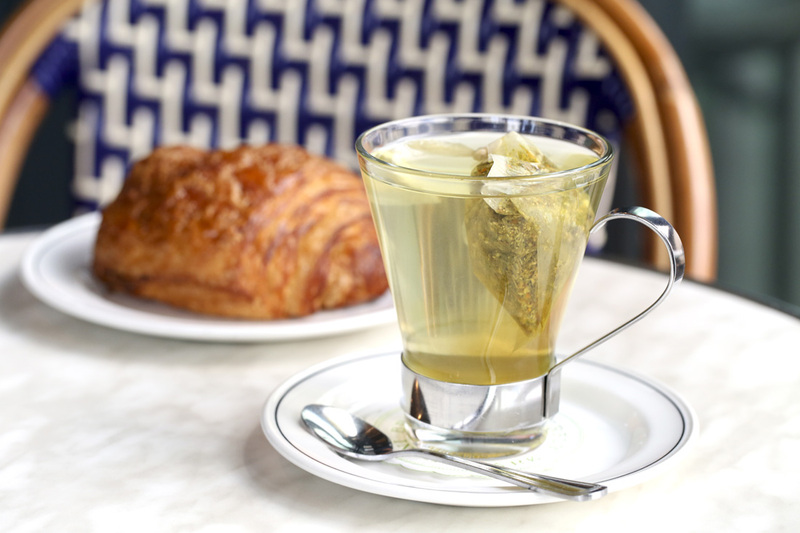 A flaky croissant and cup of tea are a luscious, light breakfast or afternoon snack. On my final visit, I succumb to that notion of leisure and bring a book to read during my breakfast. The turmeric ginger tea is delightful and so healing I pretend I deserve a chocolate croissant after being so good. It is worth every calorie. Bottom line: Billy Allin’s Bread & Butterfly dishes up classic French cuisine in the all-day café, where the food is, in true Allin fashion, remarkable in its simplicity.